In a rush in the morning? No problem. 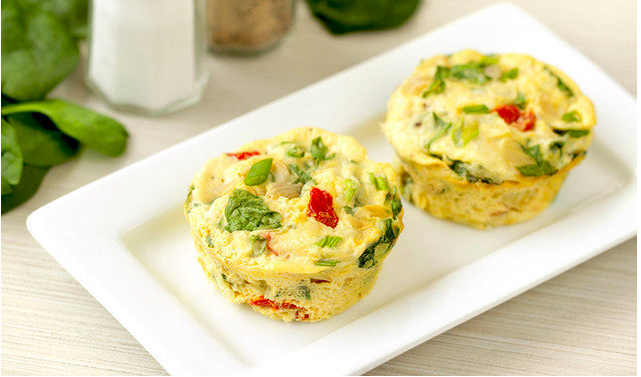 Everything Veggie Egg Bites are the perfect grab and go breakfast! Today’s recipe of the week, Everything Veggie Egg Bites, is featured from the site Hungry Girl. These satisfying bites are a terrific breakfast option for you when you’re on the run. Set aside 15 minutes of prep time and 20 minutes to bake and voila! You’ll have 6 servings of egg bites ready to start you off to a successful week! In a large bowl, whisk egg whites/substitute with Greek yogurt and seasonings until mostly smooth and uniform. Add all remaining ingredients except scallions. Stir to mix. Sprinkle with scallions. Bake until firm and cooked through, about 20 minutes. Make sure to check out the full recipe here!